I have the view from your garden on my cellphone, so I can keep this wonderful spot with me. However it is not quite so good at the moment with the tail end of Hurricane Bertha whipping around but as I have been writing this evening, there was suddenly a spectacular rainbow that arched right across the sky: not quite sure who was getting the pot of gold. We have been so lucky to have a superb period of settled summer weather and at times it has almost been too hot to walk – not what one expects of the Lake District! 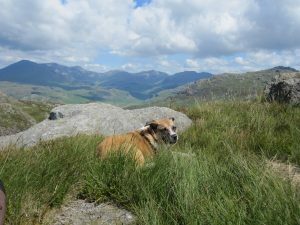 I have been exploring some of the lesser frequented fells and below is a picture of Wattie having a little rest on top of Green Crag in Eskdale – snooze with a view! One of the really special moments for me this summer happened when my friend, Hil and I were having a Pimms and fish and chip picnic in Crow Park before going to the theatre in Keswick. As we sat overlooking the lake an osprey wheeled overhead and then suddenly dived from a great height into the lake with an enormous splash and came out with a large fish – we were utterly amazed, such a wonderful sight. There are some excellent productions on at Theatre by the Lake this summer. ‘A Comedy of Errors’ is quite magical, it’s not often you find yourself clapping and cheering at the end of a Shakespeare play. I enjoyed ‘Dracula’ which is an ambitious production, perhaps not everyone’s cup of tea, Dracula himself was quite mesmerizing and the brides of Dracula were stunning. In the Studio, I enjoyed an excellent production of Pinter’s ‘Old Times’ and the Pintersque ‘The Winterling’. I am looking forward to ’Seeing the Lights’ next week.